For the past 30 years scientist have been researching this phenomena and came up with various theories to explain it. The newest finding was published in New Scientist recently but it seems like not all scientists who work on fairy circles are convinced that the answer was at last found. 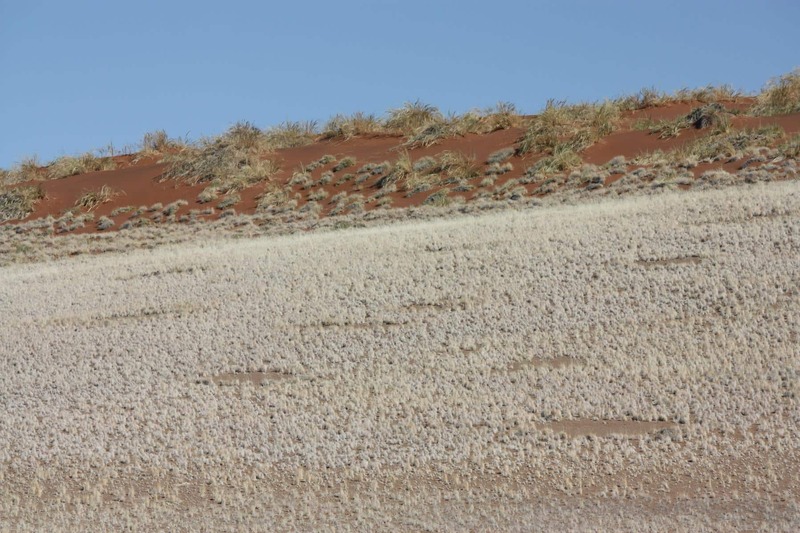 In March 2012 a team of researchers from the University of Pretoria announced that, after intensive research, they believe that these so-called fairy circles are actually caused by earth gas bubbles which could possibly indicate oil reserves. The research was led by Professor Gretel van Rooyen, a botanist from the University of Pretoria. 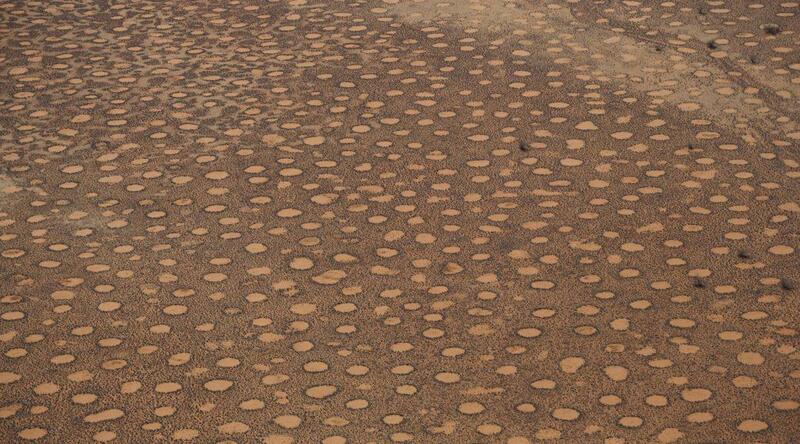 She discounted the first scientific theory (that these circles were caused by radio activity) by testing the soil. Another theory – that the soil is poisoned by the Damara Euphorbia (Euphorbia damarana), also known as the Damaramelkbos plant – was discounted because they found that certain desert plants like annual rye grass (Lolium multiflorum) indeed flourishes under Damara Euphorbias. A third theory – that Hodotermes mossambicus termites carry the plant material from the circles to their nests – was discounted by digging trenches of 2 m deep inside and around the circles. No significant termite activity was found. Professor Van Rooyen did two more experiments and realised that the soil inside the circles must be toxic and that the source of the toxins must be deep below the surface. The university’s Department of Chemistry did various tests and found that the circles are caused by bubbles of gas underneath the earth that rise to the surface. The gas first moves through cracks and sink holes before it reach the sandy soil at the top. Because of the homogeneous density of the soil, the gas that filters through small cracks, holes and the earth crust are distributed coniform. It breaks through the soil surface in an almost perfect circle. The earth gas takes the much needed oxygen from the soil and at the same time changes the chemistry of the soil. However, in April 2013 prof. Norbert Jürgens, a German biologist from the University of Hamburg, claimed that sand termites (Psammotermes allocerus) are responsible for the fairy rings. According to his research they make the rings as part of their complicated water storage system. The termites kill the grass by eating the roots and that way the water stays in the ground for years. According to him the reason why no one figured it out before is that the termites mostly move about at night and don’t build big, noticeable nests. However, Mr Walter Tschinkel, a biologist from the Florida State University, was not convinced by either theories because he himself could not find termites or anything toxic in the soil samples that he took. At the same time a botanist from the University of Cape Town, Mr Michael Cramer, was researching his theory that the fairy circles are natural growth patterns caused by competition for scarce resources. New Scientist reported in January 2017 that scientists from Princeton University found that two mechanisms acting simultaneously are responsible for the circles. Large-scale patterns are created by the termites that clear the vegetation in the area around their nests to establish water reservoirs while smaller patterns in the vegetation between the circles result from plants competing for water. It does, however, seem like the last word was not yet spoken on fairy circles as dr. Stephan Getzin from the Helmholtz Center for Environmental Research in Leipzig, Germany, maintains that there are no termites in some areas where circles are found. It is clear that these fairy circles will keep the romantics guessing and the scientists researching for quite some time! Previous PostThe GPSMap 276 legend is backNext PostTents: canvas or nylon? No they are all wrong. We stayed up at night between the fairy circles in Namibia and at about 2h00 we could see many fairies dancing in the circles. So fascinated we did not try to take photos in case we scare them away. Very interesting. I thought that the termite thing was the final word. Apparently not. The world is amazing.